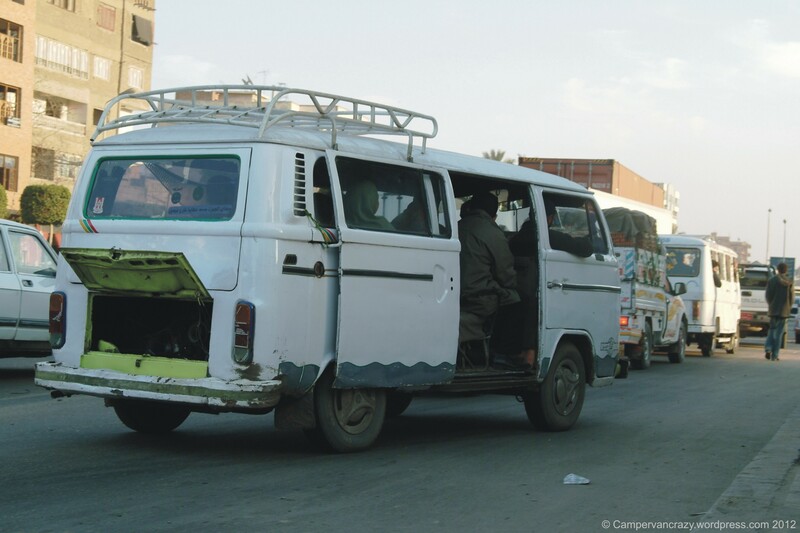 The original position for the spare wheel in a T2b Volkswagen microbus is upright in the rear left, in a section that protrudes downwards into the engine bay. But with the rock-and-roll bed this now takes away too much bed space. In the panel van it is stowed away under the passenger front bench. Does not work anymore when there is a walk way to the back of the car. 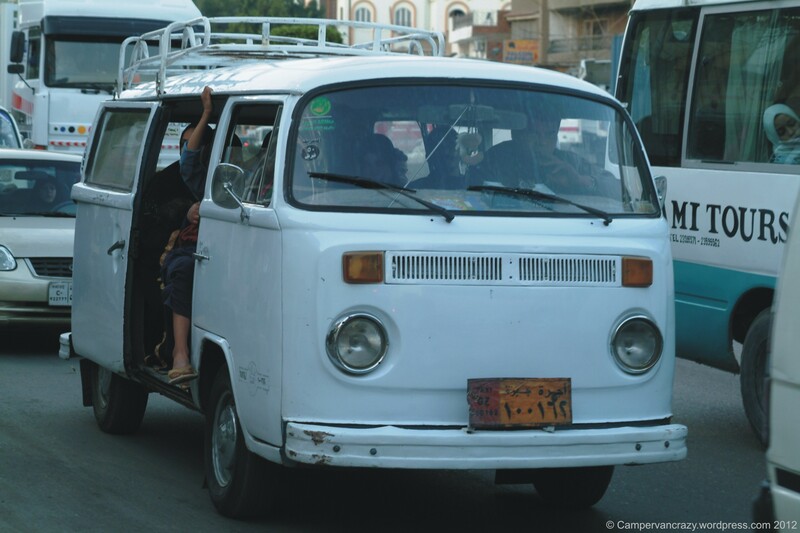 I very much like the look of a kombi with a spare wheel on the front, and a previous owner had one installed and got it registered in the car’s official paper work. 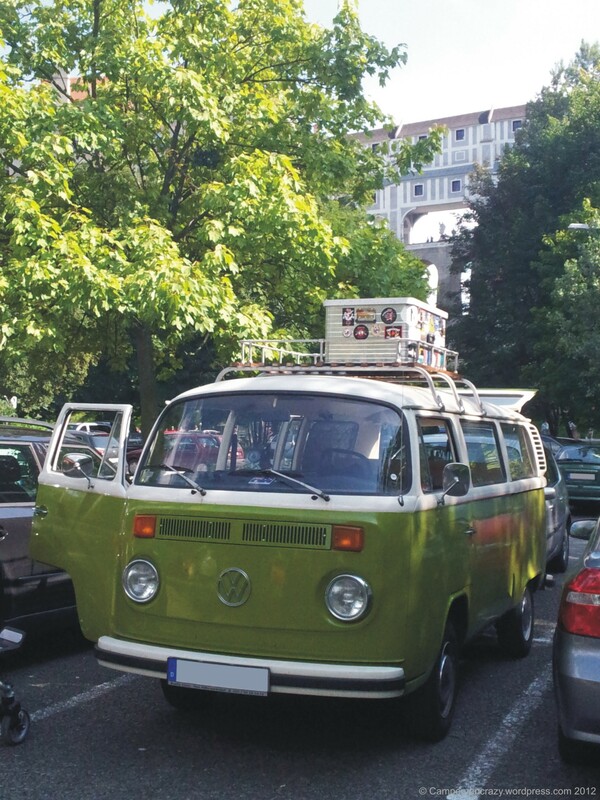 (Not easy nowadays – the technical surveillance (TUEV) in some German states refuses to accept this modification because crash tests showed it increases the risk of injuries in a frontal crash.) But when I bought Taiga Lily, another previous owner had worked really hard to close those holes on the front again and to give her a new paint job. And I now got a bit attached to the clean and simple look of a front without a spare wheel. So this year I tried something new and put it on the roof. 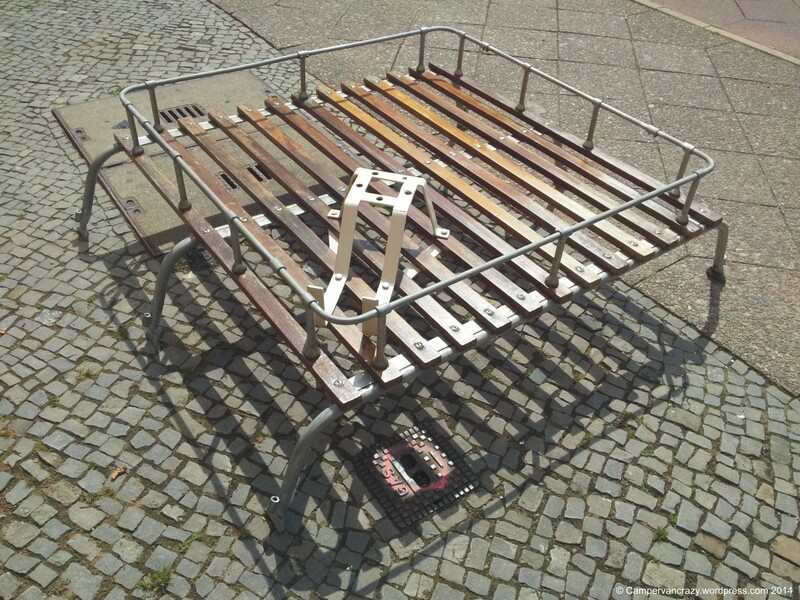 My roofrack is a pretty solid (and heavy) steel-and-wood construction. 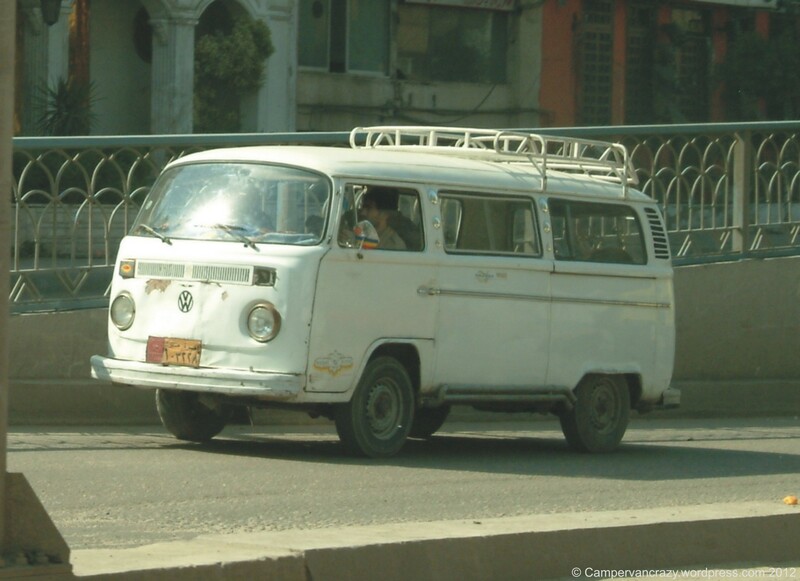 Not as elegant as the original one from Westfalia which all the cool kombis have, but way more affordable. 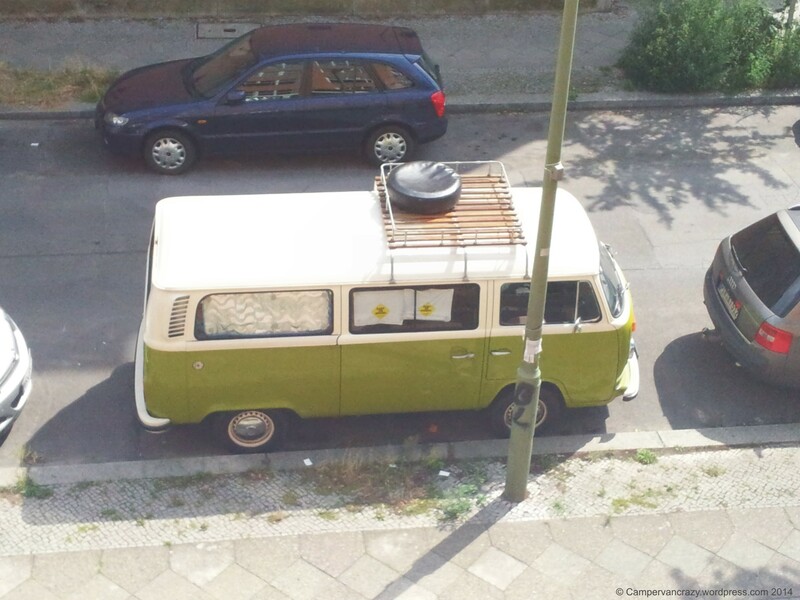 I bought it in 2006 from some German distributor, but it turned out they had imported it from JustKampers in the UK where you can still get it (Part number J12629). It looks pretty cool but the wood suffers from sun and rain. So every two or three years I sand off the loose paint bits and give it another layer of clear varnish. 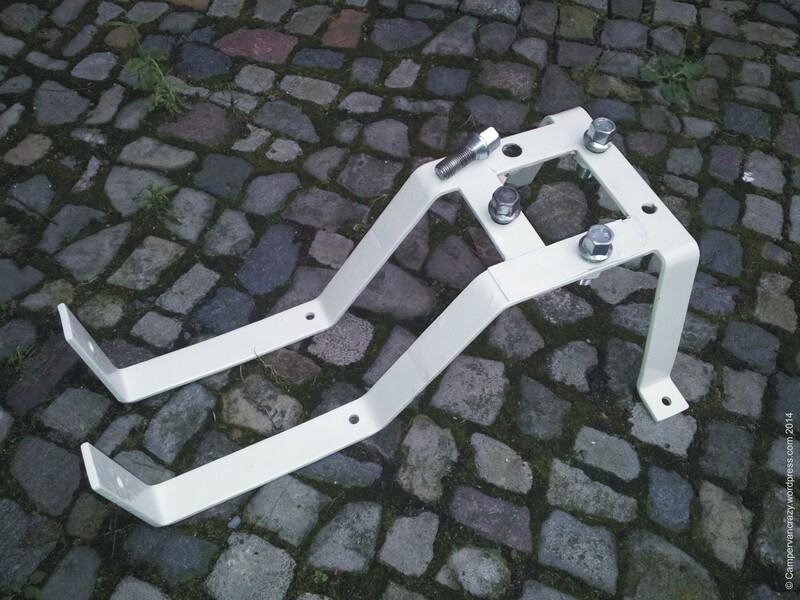 I found a bay window front wheel holder on Ebay and some matching wheel bolts at a local workshop and used both to fasten the wheel securely to the roofrack. On came a plastic bag, and on top an old spare wheel cover I borrowed from our second bus. And there we go! 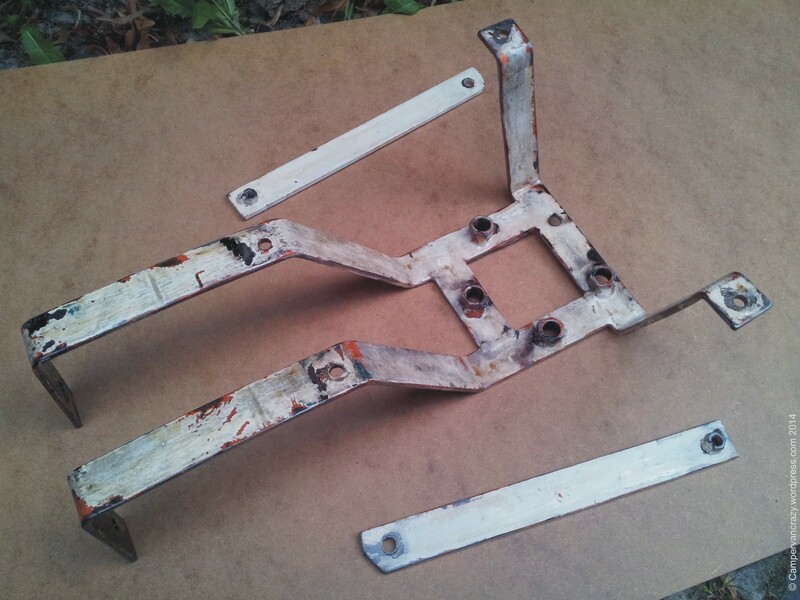 Front wheel holder after sanding and a coat with rust converter. And after adding a layer of primer and two coats of white. Wheel holder attached to the roofrack. Spare wheel in its new position! 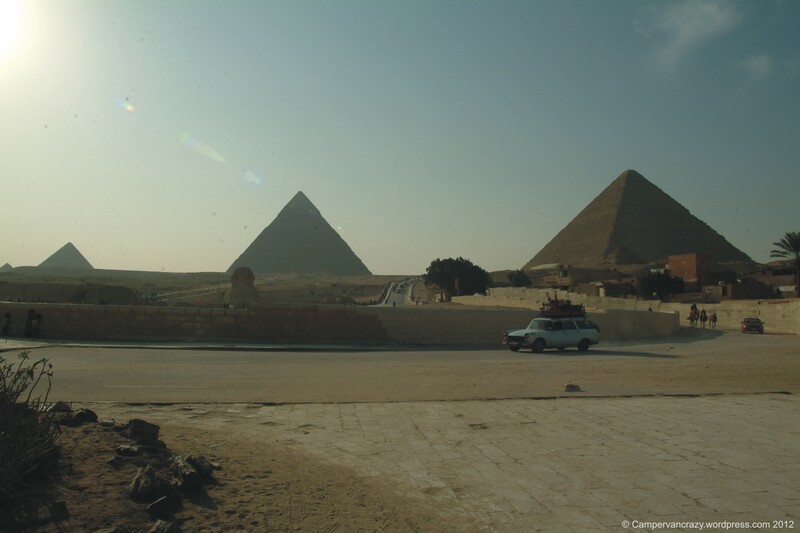 The Great Pyramid of Giza (right) and the Queens Pyramids. 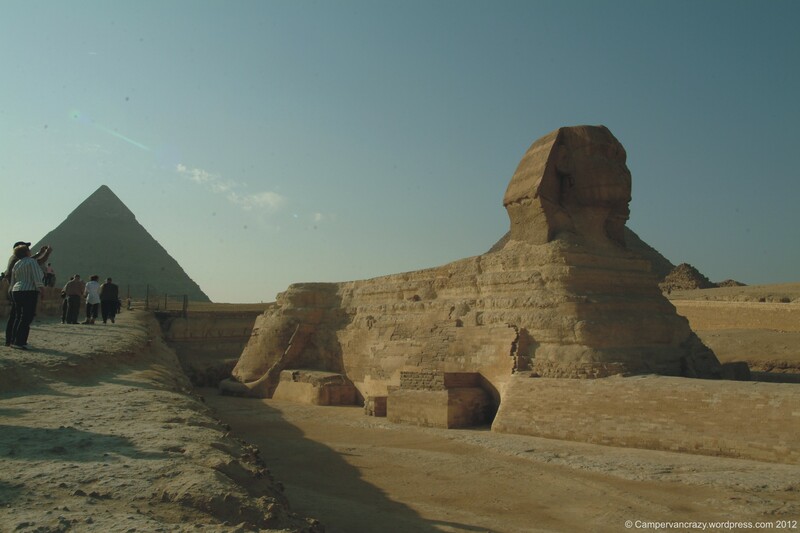 Great Sphinx of Giza close to Cairo, Egypt, in 2008. We took our one week in the Czech Republic easy and were not too busy doing touristy things. 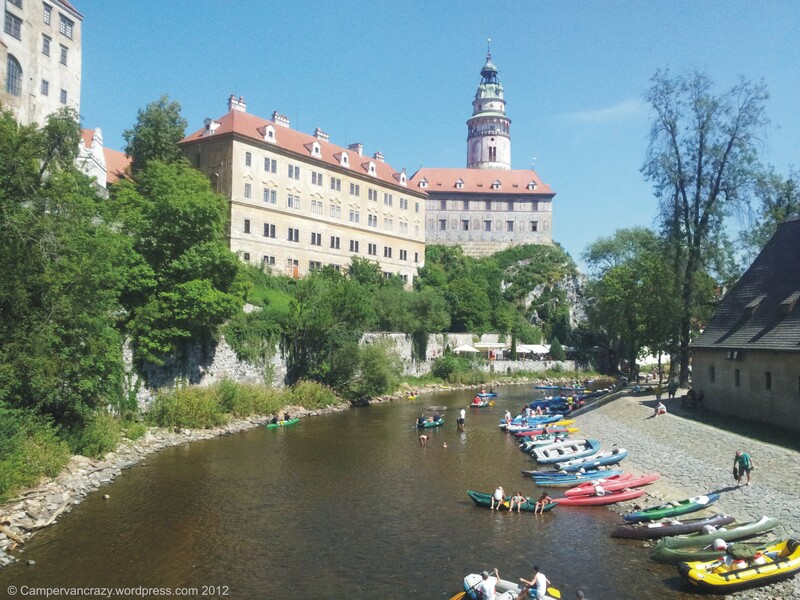 But it did turn out that the small town next door, Český Krumlov (German: Böhmisch Krumau), was quite an impressive view and worth having a closer look. I had never heard of it before, but it is a UNESCO World Heritage site and you understand why when you see the set-up of the town. The old town is nestled into an almost 360° turn of the Vltava river and overshadowed by an unusually large fortress/castle structure high up on a rock rising steeply on the outer side of the river. The architecture in the Old Town is a mix of medieval/gothic, baroque and renaissance, so there must have been some wealth in this town over a very long period of time. We also visited a beautiful museum for the painter Egon Schiele who had lived and worked here in the early 20th century. Viaduct connecting two parts of the castle in Ceske Krumlov. 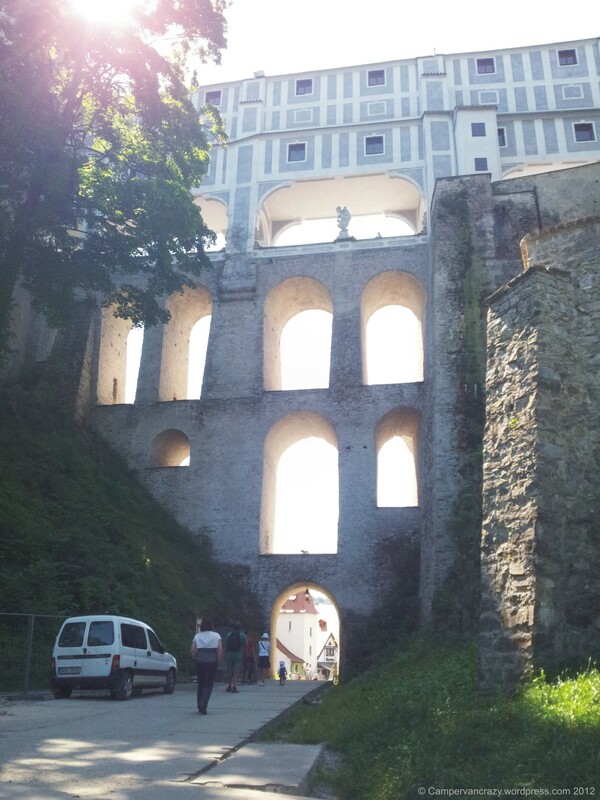 Part of the Castle above Ceske Krumlov. 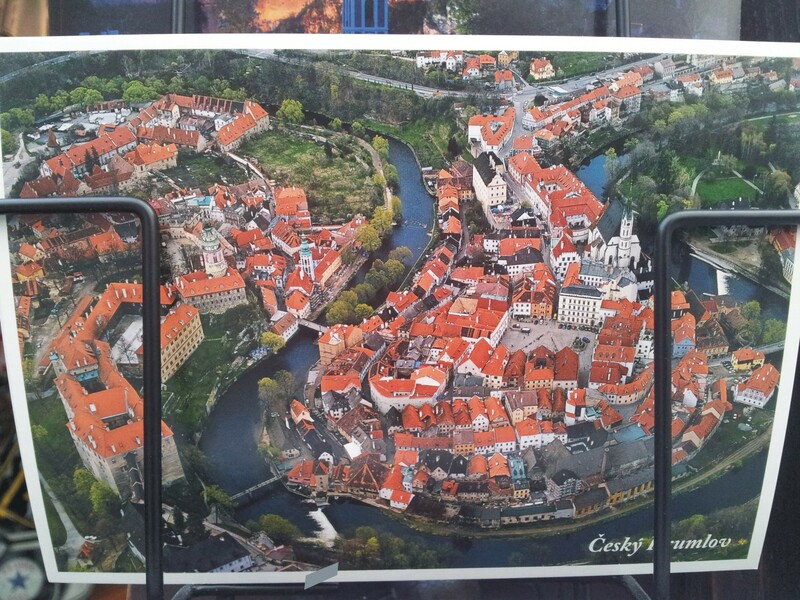 Aerial View of Ceske Krumlov. Taiga Lily at the Viaduct of Ceske Krumlov Castle. 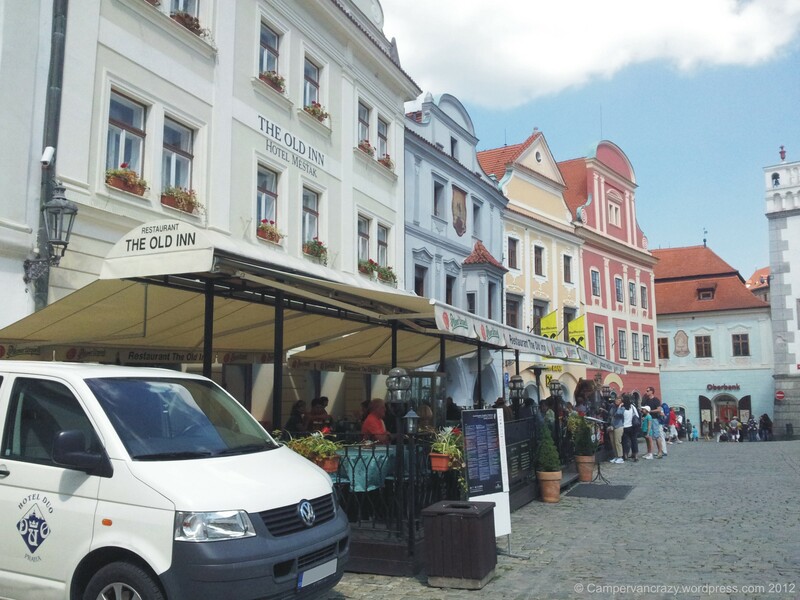 We visited Český Krumlov twice, then did a day trip to České Budějovice (German: Böhmisch Budweis), a small town with a less spectacular but still lovely renaissance / baroque town center and the Budweiser Budvar Brewery. And otherwise spent several days at the hotel, doing not much and playing with the kids. On Sunday we made the long ride back. It took us again around 9 to 10 hours for the now 540 km. 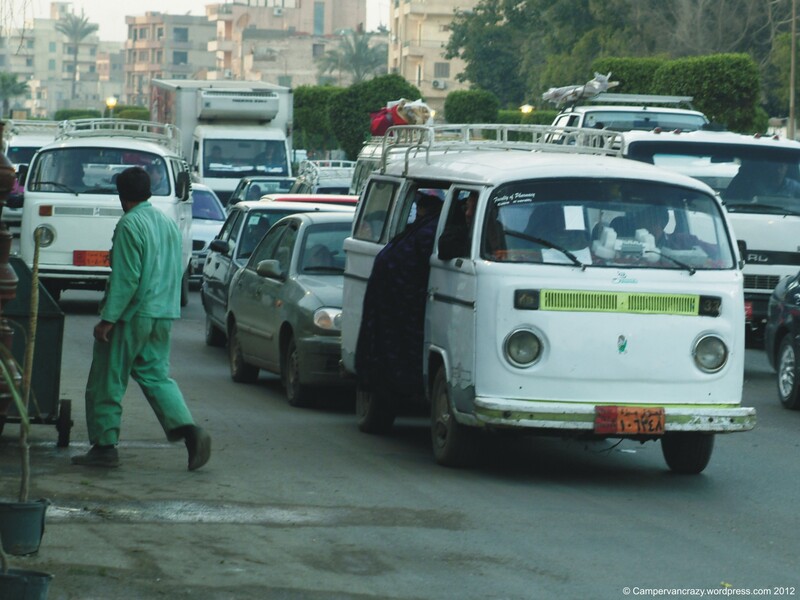 The day was probably the hottest of this summer, with temperatures around 34°C in the shade and 46°C on the road as signs along the way pointed out. Not so good when you need this air to cool down an air-cooled engine. 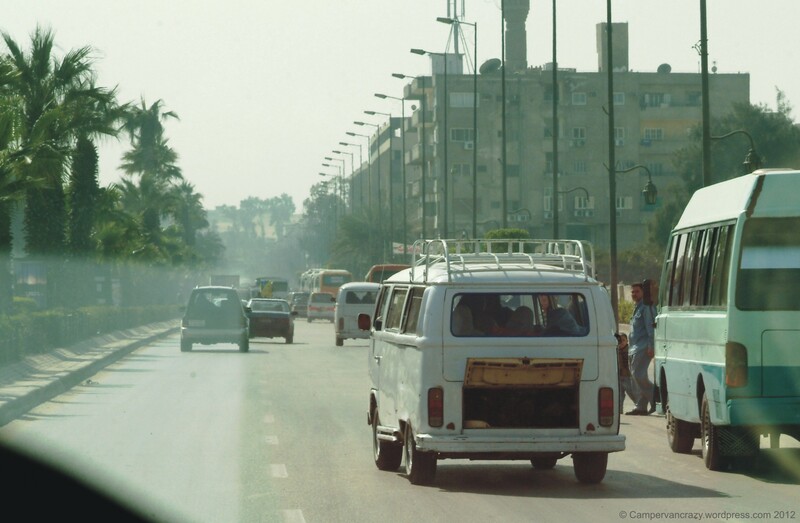 We had to slow down to 85-90 km/h for most of the way to keep the engine temperature below or at 100°C. 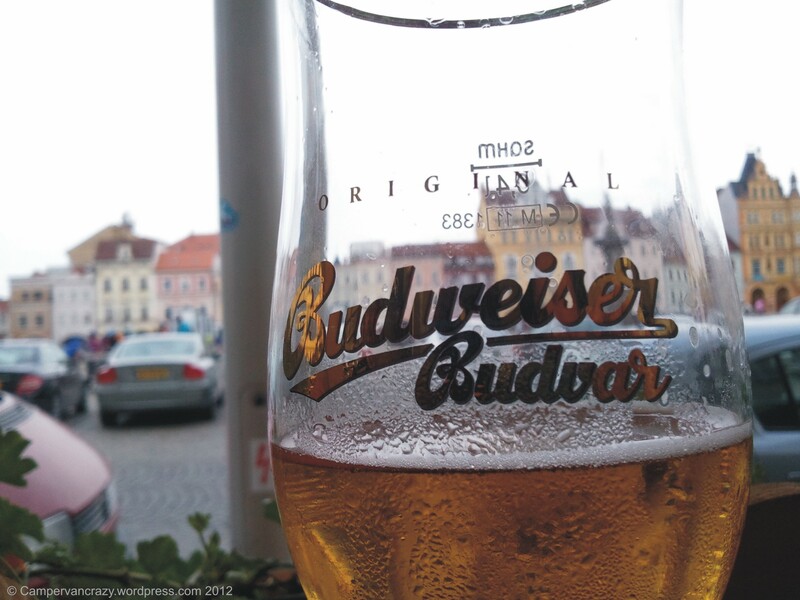 Having a Budweiser at the market square of Budweis/České Budějovice.